Intro: Laparoscopic transabdominal preperitoneal hernia repair (TAPP) has traditionally used permanent mesh. Goretex absorbable mesh is an FDA approved synthetic absorbable material approved for use as a tissue reenforcement strategy that resorbs in 2-3 months. 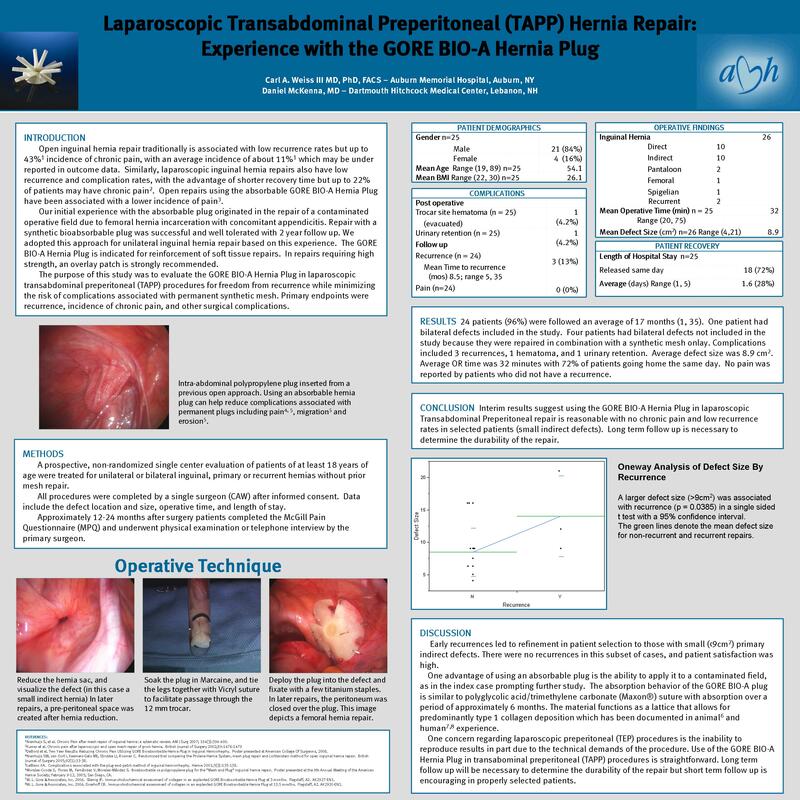 Study Design: Retrospective review of prospectively collected data from a single surgeon experience using laparoscopic TAPP repairs in selected patients. Laparoscopic TAPP repair was performed on 31 inguinal defects in 24 selected patients. Patients were reexamined by the primary surgeon at which time the McGill pain questionnaire was administered. Data: 22 Patients underwent inguinal hernia repair using the laparoscopic TAPP approach with Goretex absorbable plug. There was one incarcerated femoral hernia and one incarcerated spigelian hernia in the series. There were no instances of chronic pain. Average hospital stay was 1.6 days. There was one trocar site hematoma requiring evacuation and 2 recurrences (one pantaloon defect, one indirect). Average implant time in 16.1 months (1.2 – 32.3). Average BMI was 26.4 and average age 54 (18-89). Average defect size was 11.4 cm 2 (range 4 – 25). Average OR time was 36.5 minutes (15-75). 18 patients were discharged same day. There were 2 recurrent inguinal hernias (pantaloon, one indirect). Conclusion: Early experience suggests that laparoscopic TAPP with an absorbable plug is an option in selected patients favoring small indirect defects or repair in a contaminated field. Long term F/U is ongoing and is important to confirm these preliminary findings.